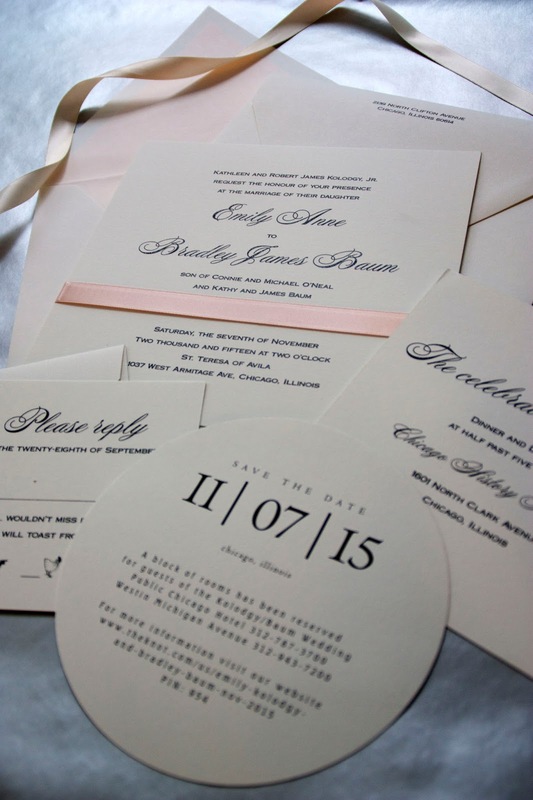 When we came across Emily and Bradley’s Vera Wang invitation suite, we knew we had to feature it. Not only does it reflect the oversize paper trend we’re seeing so much of these days, but it also shows how a delightful custom detail (in this case, a round save the date featuring a hand-drawn map) can be incorporated to add the perfect amount of whimsy. With the help of Paula Brown of Paula Brown Shop and a graphic designer friend, the couple was able to create their perfect wedding stationery look. Here, they talk about pairing grandness with simplicity and trusting the stationer’s taste. We met at work. It was love at first sight (over the cubicle walls). He surprised me with a big bouquet of flowers and I didn't let him finish asking before I said yes. I didn't have much in mind besides the colors. We loved the circle cards for the save the dates because they were different. 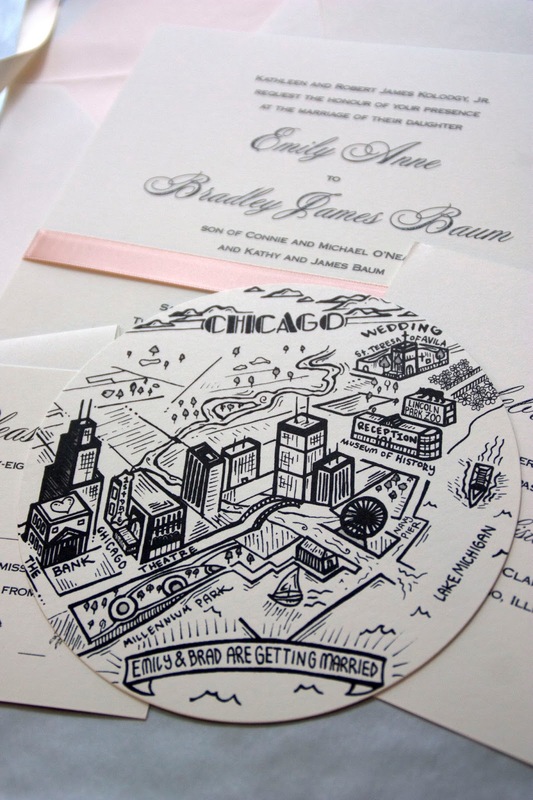 But what really put our wedding correspondence over the edge was the charming custom map of Chicago created by artist Connor Woods. Connor's map marked locations of significant events for my fiance and I since we met. If you love this concept should contact him at connorwoods41@yahoo.com to create something special for you, too! I liked that grandness of the oversized invitation coupled with the simplicity of the actual print and inner cards. The save the dates ‎were special to me and my fiance because they were made just for us! In a sense our guests get to know us better by seeing the locations of our significant events landmarked. I wasn't expecting to be able to identify what was right for me so easily! But I worked with people I knew who helped me narrow down the options based on my taste. I also wasn't expecting so many compliments! I was fortunate enough to know the bride through her employment at my shop. 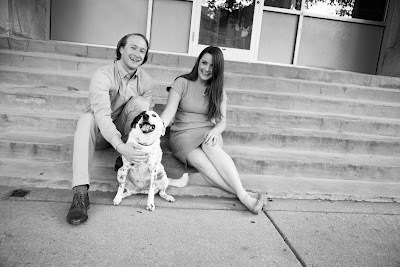 She now lives out of town and had one appointment to make her selection on the save the dates and wedding invitations. She came with her mother and Toledo graphic designer Barb Stengle. Barb knew both the bride and mother well and was involved with the planning of the wedding and reception. She was wonderful to work with and had a clear vision of what the bride wanted and what would look best. She took into consideration Vera Wang's quality of paper, their font styles and print process. Barb tweaked the proofs, with the final result being a collaboration between Barb, me and the bride. It's always a pleasure working with a team who trusts the stationer's taste, etiquette and knowledge. How do you envision your wedding? Where will the wedding and reception take place? Do you have a budget? 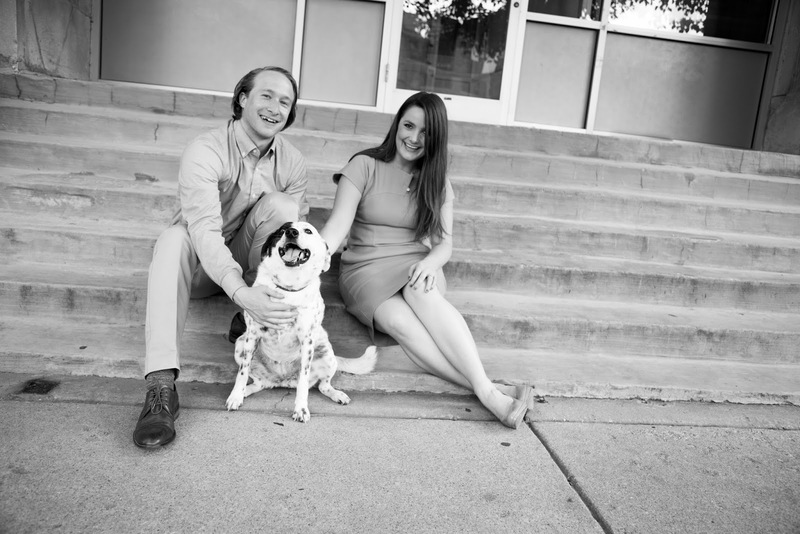 What kind of look do you want for your save the dates and wedding invitations? Do you want your invitations to reflect the attitude, decor and overall feel of the wedding and reception? We are seeing a lot of oversized invitations, like Emily and Bradley's. Why do you think this format is so popular right now? 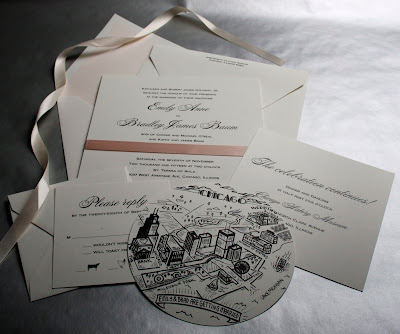 With a larger invitation, the location(s) of the wedding and reception fit nicely on one piece of paper. Duograms and motifs also seem to be on trend right now. In Emily's case, she wanted a very clean, classy and uncluttered look. They have access to so many examples and inspirations through the Internet, television, magazines and social media. Weddings used to be very private, but now it's all out there. Are you a stationer or bride who has a William Arthur or Vera Wang wedding invitation you'd like to feature in Real Weddings? Email us at concierge@crane.com.